England and Kosovo are to play each other for the first time next year after the two were drawn together in Group A of the Euro 2020 qualifiers. The former Yugoslav republic only played its first FIFA-recognised match in March 2014 - a 0-0 draw at home against Haiti. Also in Group A with England and Kosovo are another former Yugoslav republic - Montenegro - as well as Czech Republic and Bulgaria. England is one of the host nations of Euro 2020. It is to be played in 12 cities in 12 countries with some Group D games as well as both semi-finals and the final to be played at Wembley in London. England boss Gareth Southgate says his side can look forward to an "even more exciting next 18 months" after learning who they will face in Euro 2020 qualifying. The 2018 World Cup semi-finalists were drawn with the Czech Republic, Bulgaria, Montenegro and Kosovo in Group A, with fixtures to run between March and November next year. With England also to contest the inaugural Nations League finals in June, Southgate said the "next stage" for his team was "to handle expectation and make sure we keep playing at a high level". He told BBC Sport: "We've got another semi-final to look forward to this summer, there are boys who have won at youth level on the world stage and are pushing this group from underneath. "We've had a really exciting calendar year, and there is potential for the next 18 months to be even more exciting." 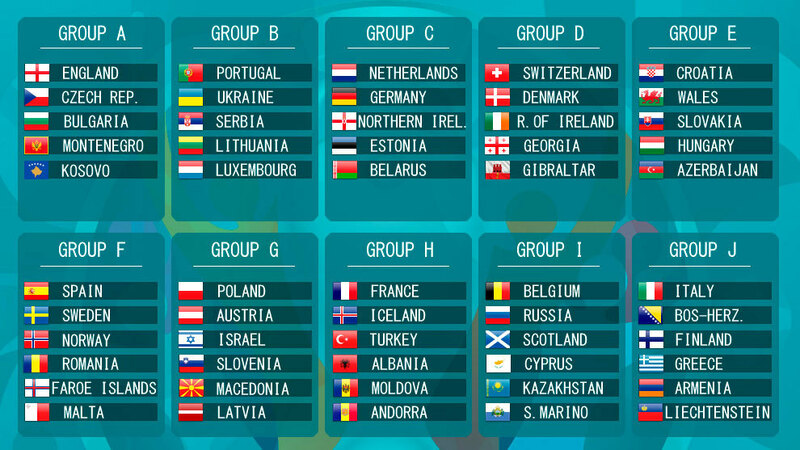 Northern Ireland have what looks like one of the most difficult draws, with Germany and the Netherlands in Group C.
Germany dropped into pot two for the draw in Dublin after relegation in the Uefa Nations League, and as well as them and the Dutch, Michael O'Neill's side will also face Estonia and Belarus. "It's very cruel, possibly the worst draw we could have got," O'Neill said. "We need to produce some of the biggest results in Northern Ireland's history, and we believe we can do that." The qualifying process is condensed because of this year's Nations League group games, with England and Scotland guaranteed a Euro 2020 play-off place - should they fail to qualify via their regular qualifying group - after winning their Nations League sections. Glasgow's Hampden Park and Dublin's Aviva Stadium will each host three group games and a last-16 match. "We respect everybody. We've not qualified for a major tournament for a long, long time, so we can't be going in saying we will easily qualify. "It's a tough challenge ahead but one I think we can achieve. If we play to the level we have shown in the past month, I believe we will have a chance." "Everybody in the pot we were in, we all were thinking we would get Netherlands and Germany after those two had been drawn together. I laughed when it did happen - but then the screen flashed up to say we were being shifted. "There was a collective sigh of relief not being in the other group but it's hardly going to be easy. "I'm not suggesting for one minute that Switzerland and Denmark will be easy. Switzerland are one of best teams in Europe and Denmark beat us in a play-off for World Cup 2018 qualification and in the Nations League. "I'm sure it will be eventful, it's really exciting. I am really honoured and privileged to be back, now we can get our teeth into it." "It could be better, it could be worse. It's good that we are in a five-team group, it's masses better. "Croatia have an outstanding player in Luka Modric but also some very good players as well. In the same part of the world Slovakia also, I don't know an awful lot about Hungary but obviously we will do our homework over the coming months. "Looking back at Euro 2016, it's about challenging the players to climb that mountain again. It had a massive effect and we want to be back there. Once you get a taste of that you want some more." "It's a tough, tough challenge, there's no getting away from that, but we have to remain positive. "We are are a developing team, we've proven ourselves more than capable of playing the best teams in the second tier of European football, now we will have to play two of the top tier again and believe we can do as well as we can. "One big result at home can build momentum and create belief - that is what we will be needing in this group." "There were some obvious fixtures, like Germany in pot two and Serbia in pot three, that could have made it a lot tougher, but I've been involved in England games long enough to know that away from home especially, where there will be an incredible atmosphere, these are games you have to get right in preparation and mentality. "That will be the biggest issue for us in preparing for those games. "The nice thing for me is that now we've got an 18-month period where the motivation is high, where we've got not only a Nations League semi-final to look forward to next summer, but this group, which is about getting through to the Euro 2020 finals and earning a right to play those finals at Wembley." England and manager Gareth Southgate will has made the traditional - and understandable - cautious noises after the draw but nothing can disguise the fact they have been dealt a kind hand in Dublin. England, currently, are in a different phase of their progress to everyone else in their group and England and Southgate can have no complaints. Last edited by Blackleaf; Dec 2nd, 2018 at 12:10 PM.. The teams I does value most are those. Did want the small teams to glory 2020 perhaps Herzegovinas second glory or Finnish first glory. Then Kazahkstan or Kosovo to glory. This pair wanted by mine will. Or those pair to glory. Is San Marino the choose of the score ????? Might I suggest the EU do this and abandon the money pit called NATO. The world will just have to learn to live with zero interest banking, no matter how much it tickles. Understand your terrible thought of your disaster. Where the United States and Canada play worse than European unity boring to you as you like being more like hockey of two options where by the United States and Canada played better with hockey called successes are sovereign of two North Americans of hockey. Know, success leads the interest. Of football, Spain, France, Serbia and Germany are more successful more European countries included than two North American USA and Canada add by Finland who has never played championship football. The clubs are the same in both parts of the world, but football is a big class difference between Europe and North America. Interest is big in Europe by football. Where good if Kazakhstan and San Marino going to group stage of the Euro. I'd be highly surprised if Kazakhstan or Kosovo win Euro 2020. DId wanted Kazakhstan and San Marino from that group. Kazakhstan or Finland and Kosovo or even San Marino to glory pretty said. Chelsea have just suffered their biggest league defeat for 22 years, against a team you'd expect them to beat. All this is dream that could become reality. The less famous Poland is the throwing nation of football. Euro 2008 qualifiers - tough group for Scotland.